TV demand data is the only global, cross-platform, country-specific audience demand metric that can be leveraged to provide actionable insights for TV series demand across all platforms, including Pay TV, broadcast and digital VOD. Each week we reveal our findings for digital series and overall series demand for the American domestic market. In the Digital Originals chart for the week of the Super Bowl 2019, demand for the perennially popular The Handmaid’s Tale from Hulu increased by 53% on the back of the release of the teaser trailer on February 3rd for the upcoming season 3. The Handmaid’s Tale is not the only TV series that experienced amplified demand, our global TV demand data also reveals that the freshman series Netflix’s Russian Doll experienced a four-fold week-on-week increase following its season premiere on February 1st. 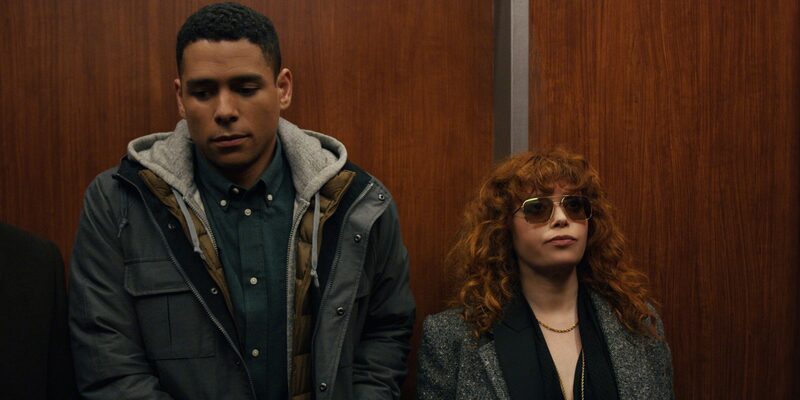 Strong demand increases are common for titles with known IP that is already popular, often resulting in a successful launch: Russian Doll is created by Natasha Lyonne, whose mind-bending Netflix show is blending comedy and science-fiction. Not a fan of zany titles this February? You may find our analysis of Valentine’s Day comedy titles an interesting read. It’s a good week for Star Trek: Discovery. New episodes of the CBS All Access science-fiction juggernaut series are now generating over 25 million daily Demand Expressions. Star Trek: Discovery released its second season on January 17th roughly three weeks ago. 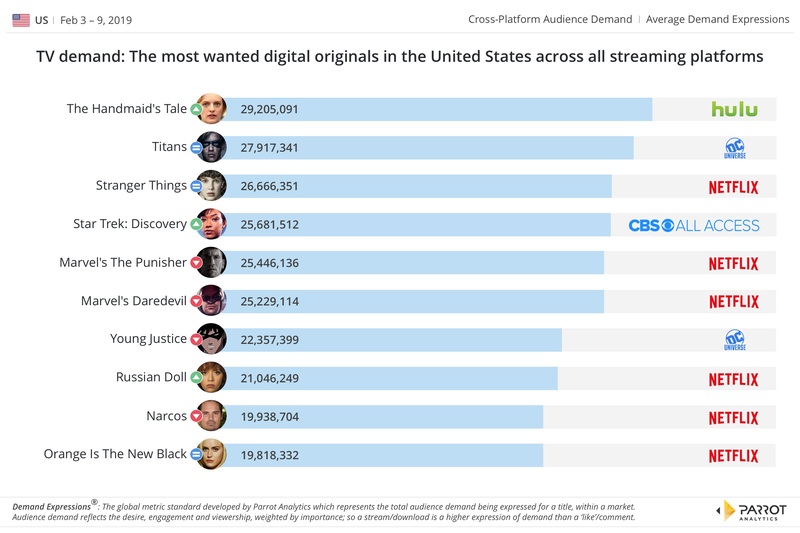 High anticipation and release day demand have seen the flagship CBS All Access original series stay in our digital chart in the first week of February, with slightly more demand than Marvel’s The Punisher. 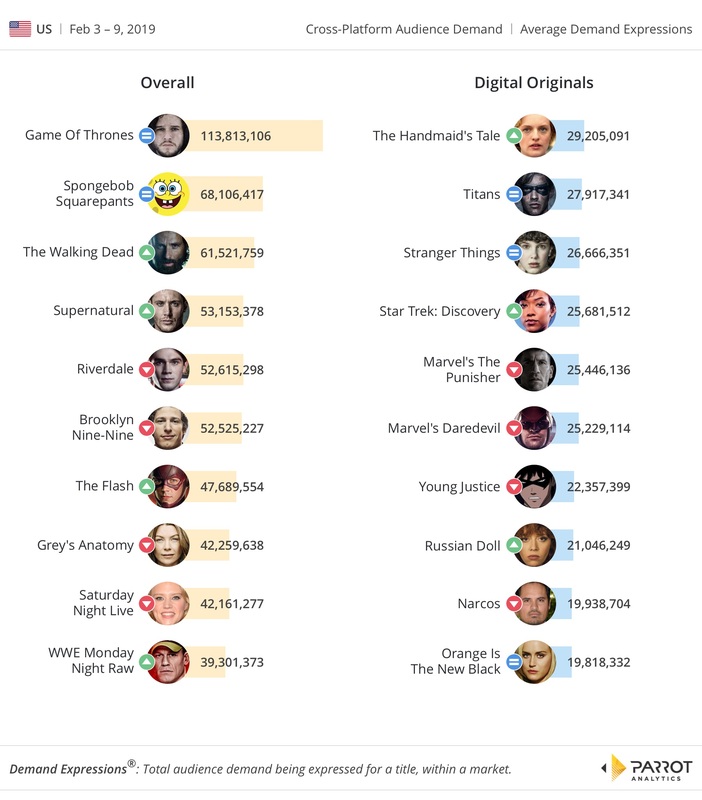 Rounding out the top ten digital TV series demand chart is the ever-popular Orange is the New Black, with nearly 19 million average daily Demand Expressions measured. In the first full week of February, we see that HBO’s Game of Thrones has made a significant gain in demand compared to all other titles in the chart – demand for the epic fantasy series doubled compared to last week following its release of stills on February 6th from the eight and final season. In the wake of a cameo appearance at the Super Bowl LIII, Nickelodeon’s Spongebob Squarepants has gained 6% on the prior week. Also, demand for AMC’s The Walking Dead rose 21% on the back of its mid-season premiere on February 9th, and its 10th season renewal. Finally, USA Network’s WWE Monday Night Raw climbed from being the 12th most in-demand title in America to the 10th rank following the opening of the show’s 27th season.